James Cameron’s Avatar Wiki Asks – Overpopulation: Should We Take Extreme Measures? The popular Green blog inspired by James Cameron’s Avatar movie has posted an article asking if it’s time to take “extreme measures” to reduce the world’s population. ‘There are too many of us already, and we must not let our numbers grow even further beyond what Earth’s resources can provide. If we want to keep/improve our current standard of living, those who are able should take precautions. A few of the more extreme ideas (i.e. killing off “unnecessary” members of a population), while theoretically efficient, seem elitist and unnecessarily drastic and cruel from a human standpoint. The total world population will reach about 9 billion in the year 2042, up from the documented 6 billion in 1999. Over 43 years, that’s a 50% increase, or an additional 3 billion people. That’s simply too many! Some world governments presently have population limitation programs in place (China), or are developing new forms of contraception. I think it’s almost becoming a necessity at this point. It’s pretty evident by now that we’ve gone beyond a sustainable population. I love the way this article is framed as a question, but really is more of a statement. “Should we take extreme measures” it asks, and then states that “it’s almost becoming a necessity at this point”. They’re not recommending extreme measures, you understand, merely discussing it. Yeah, right. 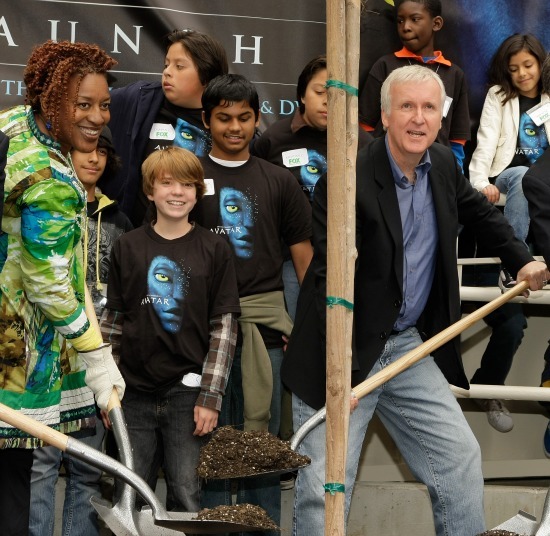 James Cameron gets some help shovelling it. James Cameron needs to get a grip. Every time he opens his mouth he lets a nutter out. The real problem for the moment is too few people owning most of the world’s resources. Let’s take James Cameron himself. What does he own? Some mean spirited sole might call him an eco-hypocrite just like his celebrity eco-hypocrites such as John Travolta. Why does ONE MAN, James Cameron, require a fleet of submarines let alone 3 mansions and 3 pools??? After you you blasted hypocrite! I could certainly approve of the idea of less hot air from hypocrites like Cameron! Oh, I forgot. 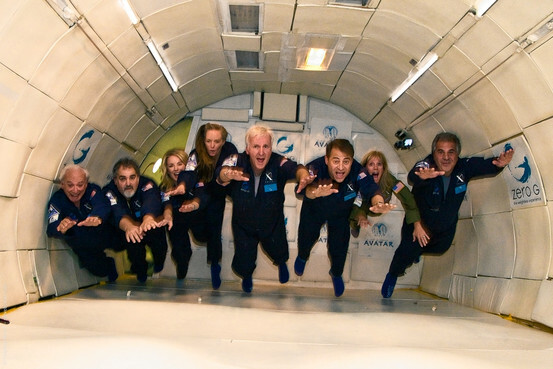 James Cameron also uses a private jet apparently. He used it during the 107-city press tour for Avatar. Hey, but I suppose he’s only flying for business purposes. Comrade Cameron uses the private jet on Party matters only, Jimbo! Purely to denounce the evils of capitalism which are destroying our planet. If he didn’t have the fleet of cars, submarines and a private jet, how could he fly to these parties to spread the news of the impending revolution? Life imitating art? All Cameron needs is a white cat and an undersea lair, say, hidden in the Titanic and he could be a credible Bond villain. I have a proposal. We take Cameron or one of his designees, and lock him/her into a cage with this character. They can battle it out to the death as to who’s the most pompously catastrophically alarming. You know, two enter, one leaves. We could call it “Thunderdoom”. In moderation, could you change that link so that it doesn’t show the icon (and hopefully my name when it’s opened, as kindly provided by Amazon). The Canadian government should strip this guy of his Canadian Citizenship. What a shame! Of course they could easily get rid of the elitist problem by starting from the “top” e.g. major film directors, ex-Vice Presidents, the leading lights of the IPCC etc . Maybe that wouldn’t work for them. So Cameron plants 1 million trees and he’s the bad guy. Nice. Planting trees doesn’t automatically make you a nice guy. Hitler planted many trees and was a vegetarian as well – what’s your point? The Nasties were one of the most greenest political groups, who were in power, the world has ever seen. Thanks Jimbo. The second essay, though, is actually written by Janet Biehl, I think. She was Murray Bookchin’s wife. It was published together with an essay by Staudenmaier. A really interesting essay is “Man and Earth” by Ludwig Klages, written in the late 1920s. It’s an eco-fascist pamphlet, and it’s creepy how close it sounds to a modern Green party leaflet, right down to mentions of sustainability and even saving the whales. Just Google it – someone must have posted it somewhere. If not, I will. If an “Elitist” like James Cameron killed off two of his superfluous daugthers it may set a good example to the rest of us. Isn’t that what the Nazi’s did – killing of “unnecessary” members of society. And that was before they started on the Jews. Many people think that drastic and cruel. The fact that the Avatar movie has insired a green forum only goes to show what a bunch of uninsightful and frankly unimaginative people the residents of that forum must be. Personally I find the Avatar world-scenario to be profoundly disturbing, simply because there are way too many coincidences happening at once on the Avatar world. Consider, the Avatar world seems to have one enormous interlinked neural net that covers the planet, yet no investigation of this net is ever seriously made. The ecosystem all ties into this net for all or at least a lot of its time, ergo the net can monitor the entire ecosystem. Consider also the “unobtanium” mineral. It is peculiarly useful, peculiarly rare, and quite assuredly not a natural occurrence since it seems only to exist on the Avatar world, and not otherwise in that star system. It has natural properties which appeal ONLY to a mostly-civilised society which can cross between stars, but which is not sophisticated enough to analyse the material and simply duplicate it by artificial means. A civilisation, in other words, that is quite low on the Somolev scale of energy usage and is only just able to cross interstellar distances. The whole scenario stinks of a trap, one designed to detect the presence of intelligent life forms which aren’t all that strong as a civilisation but which are smart. The trap has apparently been sitting there for millions of years with the natives apparently locked into a miserable Stone-Age existence by the planet-wide neural net system. Were I the management of the Avatar mining company, I would be looking to make the builders of this trap assume that the entire world had been obliterated by a natural disaster. Carpet-bombing with nuclear weapons would be my first port of call, with hypervelocity impactor bombardments the next. On no account would I try to work with the local inhabitants, since they would undoubtedly be part of the detection system and linked into the command and control system of the trap. If I could not swing that decision, I’d be looking to establish a truly large military force throughout that star system and all neighbouring ones; any civilisation capable of setting up such a scenario would not be friendly, and would be extremely capable and highly dangerous; it would also not be at all friendly. Short term, you’re right. Long term, Malthus is right. The Earth’s human population cannot grow without limit. Your choices are vice, misery, and moral restraint. Since any voluntary program for population control will selectively breed non-compliant individuals, moral restraint will fail in the long run. That leaves vice (compulsion) or misery (starvation, epidemic disease, genocide). Take your pick. No the choices aren’t restricted to those two as you simplistically envisage it. Globally speaking, as affluence rises, TFR falls. Fact. The population of the world will level off somewhere around 2050 and then start to decline. That’s according to the demographers at the UN. The choice between compulsion and misery is a neo-colonialist fantasy from the likes of moral guardians like Dr Guillebaud who have a moralistic agenda they want to impose. I reject your false dichotomy. I choose affluence.